A thin, bituminous based aluminium protective coating of brushing consistency that dries to a silvery finish. 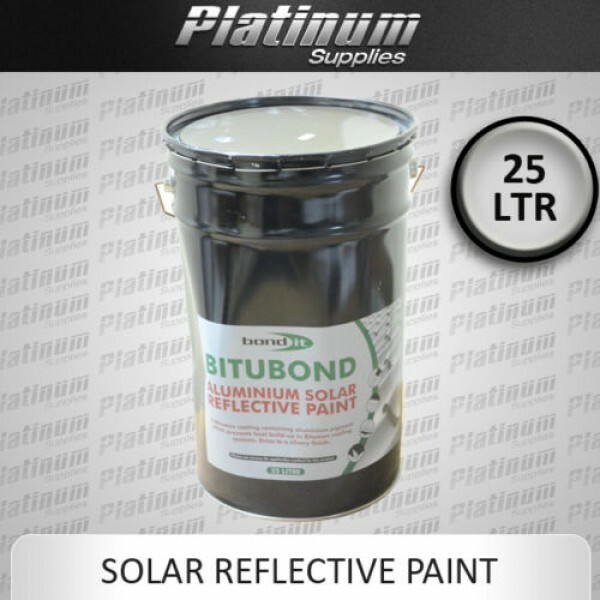 Bond It ALUMINIUM SOLAR REFLECTIVE PAINT is a light/heat reflective coating that will provide protection against solar degradation and heat gain. It is suitable for use over bituminous coatings, aged asphalt and primed steel. It is not suitable for direct application to expanded polystyrene. All surfaces must be structurally sound, clean, dry and free from surface contaminants such as grease, rust and dirt. If necessary, remove any organic growth i.e. moss or lichen, with a fungicidal wash. If the surface is still dusty after cleaning, or covered with weathered bitumen, prime with BITUMEN PRIMER and allow to dry. STIR VERY THOROUGHLY BEFORE USE. Do not thin. Apply immediately and continue stirring periodically during use. Apply by brush or mohair roller When brushing, use soft bristle brushes applying the lightest of pressure. Apply 2 coats, the second coat being applied as soon as the firsrt coat is dry. Over bituminous surfaces apply the thinnest coat necessary to obliterate the balck colour of the bitumen coating for the first coat. The second coat should also be thin. Avoid the formation of pools. Do not apply when rain, frost or overnight dew are expected before the coating is fully dry, as bronzing of the surface may result if these conditions are not observed. When applying to large areas on bright days it is advisable to wear polarized sunglasses to reduce glare. Approximately 1 hour depending on temperature, humidity, air and base conditions. Shelf life of this product is a minimum of 5 years under good storage conditions in original unopened containers.